The new film Thunder Pulling 9 is available. On DVD and also in High Definition on Blue Ray Disc. With running time of almost 3 hours it is the best and most spectacular part of this series with a lot of new footage of tractors and events. We covered the European and the American pulling events from this past season. Filmed close-up, trackside in High Definition, from different camera positions. To get all the noise, dust, vibrations, smoke and fire that Tractor Pulling offers, on film. Of course with never before seen onboard footage, slowmotions and team reports beside closeups from the Pulling Tractors. If you watch Thunder Pulling 9 you will think to be right on the track, when the Tractors are thundering by. All the top machines from europe were on the track and also Young Blood Unleashed from the United States with his 6 engined, over 12.000 horsepower strong Unlimited Mod. Earthshaking, Earsplitting Show in the Stadium with the best Pulls from all classes, interviews from Pulling-Lady Manon Kools IH Super Stock and Brian Shrameks "Young Blood Unleashed"
Featuring the Super Stocks, Pro Stocks, Modifieds, Mini-Unlimiteds and Unlimited Modifieds. Starting up the Outdoor Season with the biggest German event in Füchtorf - the home of the Green Monster Team. A lot of international tractors were there, testing their new equipement. The biggest European event. 3 Days - and Nights under the lights - of pulling on 3 Tracks. All EuroCup Classes are running and the NTTO-divisions. You will see all the Stars and Tractors from the European Pulling Scene. OnBoard Camera right behind the tractors on the Sled. Dust flying filmaction - never seen before. Also Onboard footage (Cockpit) from the American SS Champion "Controlled Chaos" - a V8 IH Super Stock. A great report about this wonderful and traditional event. One of the best organised events from this past season. The Finals in the Mini Unlimited and 4,5t Modifieds were held in Kollerschlag. Over 20.000 spectators watched this 2 days mega event. Home of the turbine powered Hot Iron Mini team. You will see great Sled-Onbaords and dust flying Full Pulls. Lambada, Whispering Giant, Four NoHemi, IVAN, Green Spirit ... shaked the earth!!! the most prestigious pull of the season. The best tractors from all european countries fighting out the title. 2 Days of pulling also in the night. Very fast Full Pulls and great competition filmed from different camera angles. OnBoard filmed engine explosion of Black Power ... and much more. The worlds biggest and best Tractor Pulling event. From New York to California all the American Tractors are in this Competition. There are over 50 Tractors on the starting line in one division. Side by Side pulling on 2 PowerTracks gives you the best Tractor Pulling Show in the world. From Friday Noon til Sunday evening - also under the lights - the earth is shaking under the 12000 horsepower Unlimited Modifieds with their 6 engines and tirespeed in excess of 100 miles/h. Powerful machines with chrome and airbrush. A lot of highflying dirt, wheelspin, fire and engine-sound. Also 2 european teams from Holland are pulling in Bowling Green. Lambada and BobCat Junior run the MINI Modifieds - very successfull - we reported all their runs with trackside footage and onboards. And interviewed Wim Dingerink and Berry Boer - the 2 youngsters who pull against the big dogs...like Ken Veney and Larry Koester. We filmed the whole event - day and night - in the pits - on and beetween the 2 pullingtracks. All classes are shown: MODIFIEDS, LIGHT and OPEN SUPER STOCKS, MiniUnlimiteds, TWD-Trucks, FWD-Diesel, PRO STOCKS, SUPER SEMIS, DIESEL SUPER STOCKS, SUPER SEMIS and the Stars of the Sport: UNLIMITED MODIFIEDS. A lot of spectacular things happened like the engine Fire and explosion of Brian Shramek`s Unlimited "Unleashed". Adam Bauer and L.D. Nation made a tremendous show with their multi engined machines. 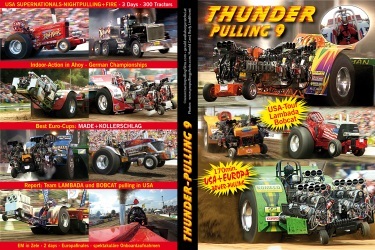 Tractor Pulling in America is outstanding - you can`t describe it - FEEL and GET IT ON THUNDER PULLING 9! 1. Online with PayPal. Price Euro 19,90 (DVD) or Euro 29,90 (Blue Ray) plus Euro 3,-- postage. Press the button "ADD TO CART".